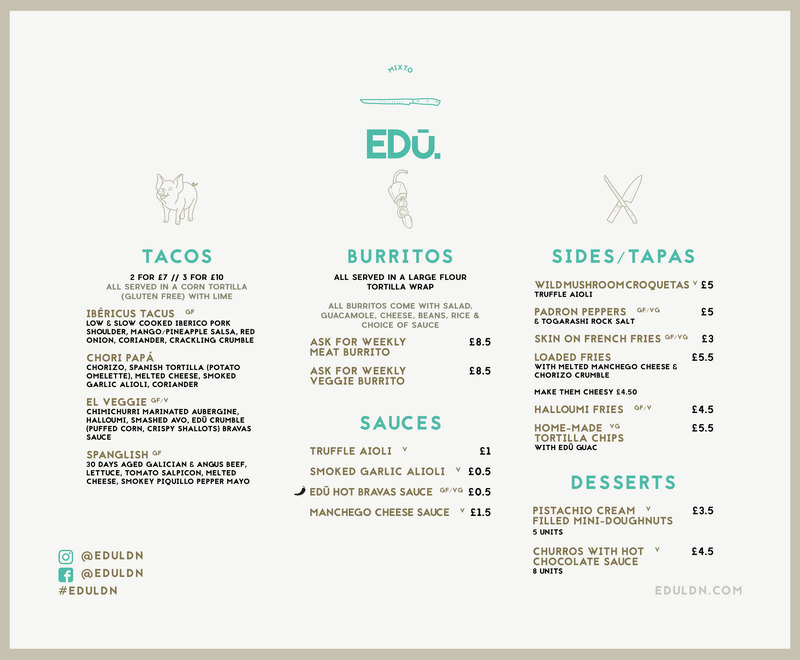 EDū is a contemporary Spanish food concept, and the brainchild of Eduardo and Daniele, who met over 10 years ago in southern Spain. Their aim is to bring a fresh approach to Spanish cooking and dining in the UK. Whilst taking their inspiration from classic Spanish recipes and sourcing traditional seasonal Spanish ingredients, EDū’s ‘mixto’ concept is also influenced by international cuisines. Eduardo and Head Chef Dani (who has worked at Bo London, Chiltern Firehouse and Galvin) signature dishes will include, the ‘cheeky dog’, Tempura Padron Peppers and the Spanglish burger. Want to talk to us? Hit us up using the form below or email hola@eduldn.com.